Gun Control Debate » Is there a need of strict gun control laws to be amended? You are here: Home // Gun Control, Gun Control Laws // Is there a need of strict gun control laws to be amended? 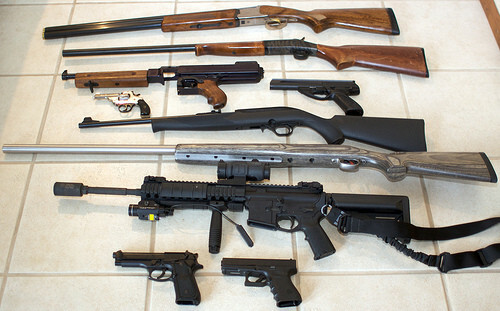 Posted by Gun Control Debate on Mar 05, 2012 | Comments Off on Is there a need of strict gun control laws to be amended? Today all most all the countries have their own gun control laws to prevent crime. Every government has to take a proper care about the public in the country. Generally when a law is made it will be followed by only good persons. Actually the law is meant to prevent criminal acts from the bad people who does not care any one and look upon only themselves. These persons who will be indulged in criminal activities will have a good backup and a person will be behind them to get them all the facilities to carry on the criminal act. There is no need to amend any more gun control laws, but instead the current law has to be made very strict by making the law to be followed by every person in the country. The criminals will be sometimes looked after by the members of the government and hence it is very easy to perform criminal activities as the person will know the in and outs of the law. These persons has to be tracked first and sent to prison as this will create imbalance and creates a bad environment in the country. The current law has made the public very insecure as they are not allowed have guns as easily as possible. Before people used to keep guns in their house for their security but today by these gun control laws they are very easily accessible for the criminals which have increased the crime rate in the countries. If a person is having a gun it does not mean that he is a bad fellow and it should be noted that, he will be having it to get guard from the increased crimes in the country. Instead of making the gun control laws very strict as mentioned before, the law as to teach the people on how to use the gun and what are the disadvantages of making crime. Some times people commit suicide by making use of these personal guns. They have to be preached in such a manner that, how is important for the country’s future. Most of the times, crimes are done because of drug addiction. So there should be strict law to prevent the supply of drugs which will clear the crime rate for some extent. When all these policies are followed by the government of the country they can keep their people safe and the country in peace.